As David Beckham puts it, “99 was a good year for me,” and now the famous footballer, husband and father of four has a brand-new “99” pinkie tattoo to commemorate everything he accomplished that year. In addition to tying the knot with his wife of 16 years, Victoria Beckham, David also helped Manchester United to a historic Treble, which in English football means winning three trophies in a single season or solar year, reigning supreme in 1999’s Premier League, FA Cup and UEFA Champions League. 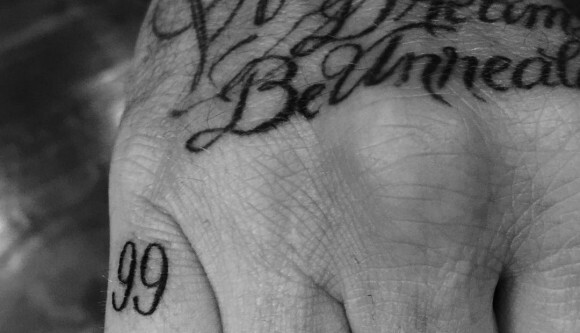 David Beckham’s new “99” tattoo is inked in a simple black font on the pinkie finger of his right hand. If there’s one person David Beckham loves getting inked in honor of, it’s his wife, who has stood by his side for the past 16 years (cheating allegations and all) and given him four healthy, beautiful children – Brooklyn, 16, Romeo, 12, Cruz, 10, and Harper, four. It makes sense then, that David would want a tattoo to commemorate his marriage to Victoria, which took place almost exactly 16 years ago, on July 4, 1999. There’s no denying the fact that David and Victoria Beckham are a power couple, and if every tattoo tribute David gets for Victoria makes their relationship stronger, these two will for sure be together till the end. In addition to his new “99” hand tattoo, David Beckham has gotten dozens of other tattoos inked in honor of Victoria, including a Bridget Bardot-style portrait of his wife on his arm, a “Victoria” tattoo on his hand, a Hebrew “I am my beloved” tattoo on his arm, and a ring of roses around his bicep. In fact, David has hit up the tattoo parlor almost every year since he and Victoria tied the knot for another new anniversary tattoo, and this “99” ink is it for 2015! Conveniently for David, 1999 also happened to be a landmark year for his football career. After being sent off against Argentina in the 1998 World Cup, David Beckham bounced back spectacularly in 1999, and had a truly fantastic year on the field, not only achieving the unprecedented feat of a European treble, but providing assists for two goals in the final of the Champions League that year, leading to a unexpected victory over Bayern Munich at the Nou Camp in Barcelona. Now that David has retired from football, it seems the 40-year-old husband and father is feeling a tad bit sentimental, getting this new “99” pinkie tattoo to remember one of the best years of his career. Can you blame him? ?